It's advised to download the game from a fan mirror because it is specifically made for multiplayer so therefore it is patched with the latest patches underneath. Released for free in 2010. 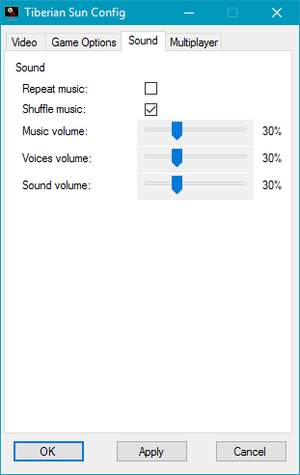 Unstable and laggy on Windows 8. Project Perfect Mod - The most expansive TS mod site. Version that has been released for free by EA. A streamlined fan-created installer that applies fixes for various issues, adds modern networking support and Windows support, and includes The Final Sun map editor. Pre-configured packages for OS X and Linux are also available for download. A fan patch that adds modern networking support, fixes for various issues, new renderers, a new game launcher, and the Final Sun Map Editor. This is a small fan patch made as an add-on which is meant for optimizing and fixing the game as well as expanding modding capabilities. It is in development and more features are to be added. 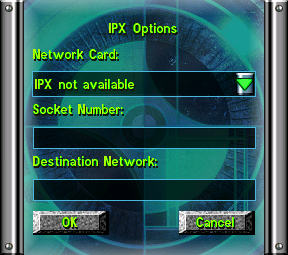 This is a small patch that lets you play LAN on Command & Conquer: Tiberian Sun in Windows 2000 and above by changing IPX protocol to UDP. 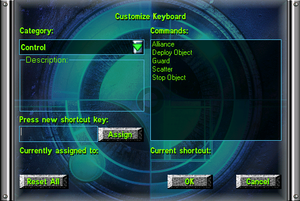 External general settings (for the TSpatch and TS Installer version of the game). 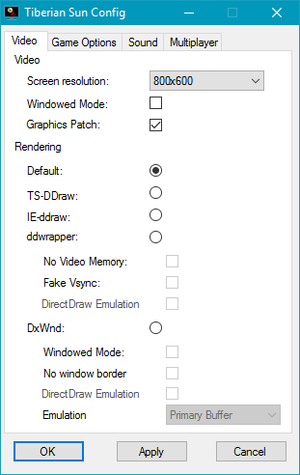 External video settings (for the TSpatch and TS Installer version of the game). TSpatch (or a pre-patched version of the game) is required. See Widescreen resolution. TSpatch (or a pre-patched version of the game) is required. See Windowed or choose fan mirror #2. Go to the [Video] section. Change ScreenWidth and ScreenHeight strings to resolution of your choice. "Widescreen in multiplayer works as described above. However, many hosts enforce resolution limits. 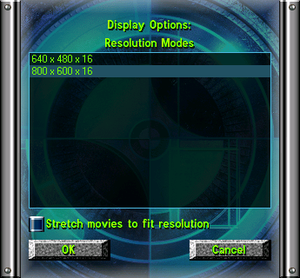 If you try to join a game with a resolution limit, you will be forced to play the game at a non-widescreen resolution (usually 640x480). If you host a game and are using a widescreen resolution, you will not have the option of enforcing a resolution limit." In the Target area, add -win. Change the StretchMovies string to Yes. 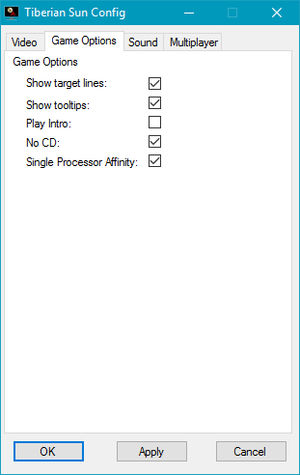 External audio settings (for the TSpatch and TS Installer version of the game). Firestorm expansion wasn't officially localized. Fantranslation available here: download. Requires LAN patch to function on modern Windows. 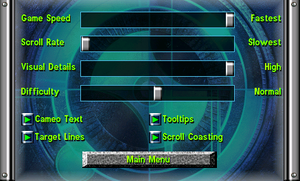 Alternatively, installing a pre-patched version of the game also works. 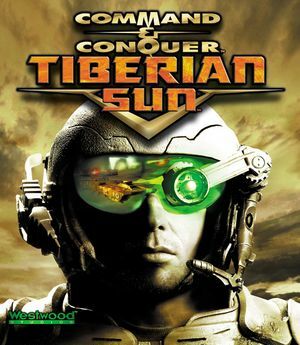 Tiberian Sun will crash to the desktop upon loading some later campaign maps if there are too many saved games. Delete some saved games and the level will work. On the Libraries tab, add "wsock32.dll" for the library replacements. Run 'wine regedit', browse to HKEY_CURRENT_USER\Software\Wine. If there is no key (the stuff with folder icons) called AppDefaults, then create it. Run the game through Wine and enjoy. This page was last edited on 12 March 2019, at 01:54.